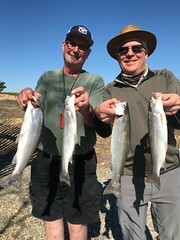 New Clients Mitch and Jody were onboard with meat Don Pedro on June the 22nd. 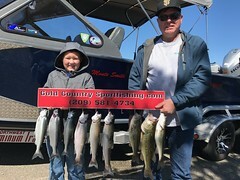 The fishing has been outstanding and on this day the fishing was still great, however it was a little slower than it has been. The two guys had plenty of action releasing many fish and keeping their ten fish. It was a great day with two great guys. Thanks for coming out. 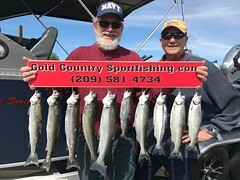 This entry was posted in California, Don Pedro fishing guides, Don Pedro Lake, Gold Country, Gold Country Sport Fishing, Kokanee, Melones. Bookmark the permalink.